Dr. Kim Joon-young is caught in the worst Groundhog’s Day ever. Like clockwork, he keeps waking up on his Seoul-bound flight, knowing he will scramble in vain to save his daughter from a fatal car accident. It is a horrible thing to experience over and over again, but he eventually learns he is not the only one repeating these painful hours in Cho Sun-ho’s A Day (trailer here), which screens during the 2017 Fantasia International Film Festival. Dr. Kim is a famous humanitarian doctor, but pretty clueless as a dad. He really wants to patch things up with his twelve-year-old-ish daughter Eun-jung, but by the time he reaches their rendezvous, he finds her dead in crosswalk. Soon thereafter, the cycle repeats. He tries to pick-up time, but he can never get there quick enough. Much to his shock, ambulance driver Lee Min-chul is in the same position. No matter how hard he tries, he cannot rescue his wife Mi-kyung, who perishes in the back seat of the yellow cab that plows into Eun-jung. They will team up to save their loved ones, but they are in for at least one more nasty surprise. It is time to retire the repeating time-loop concept for a while, because no film will be funnier than the original or manage to top the intensity of A Day. Unlike other Groundhog homages, just about every go-round in Cho’s film turns into a tense race against the clock. It also gets a little weepy during the climax, but it is a Korean film, so we can’t be too dismayed by that. Kim Myung-min is terrific as the driven Dr. Kim, quietly radiating anguish and Sisyphean determination. Young Jo Eun-hyung is quite charismatic as the daughter, whom Cho never even gives a chance to become annoying. Byun Yo-han is maybe a bit wooden as Lee the EMT, but you could argue he is supposed to be emotionally distant. Regardless, the scenes in which he and Kim start to put it all together really raise the hair on the back of your neck. That’s maybe already saying too much, but Cho’s breakneck pacing will hold even the most skeptical and resistant viewers rapt until the final day closes. The Broadway version of Groundhog Day is a super-satisfying show, but the thought of someone trying to stage this film as a book musical is almost too deliriously crazy to contemplate. 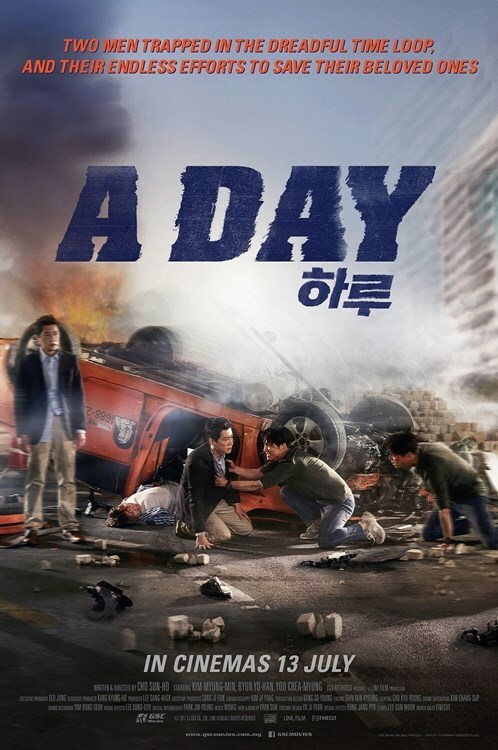 Very highly recommended, A Day screens tonight (7/22) at this year’s Fantasia.